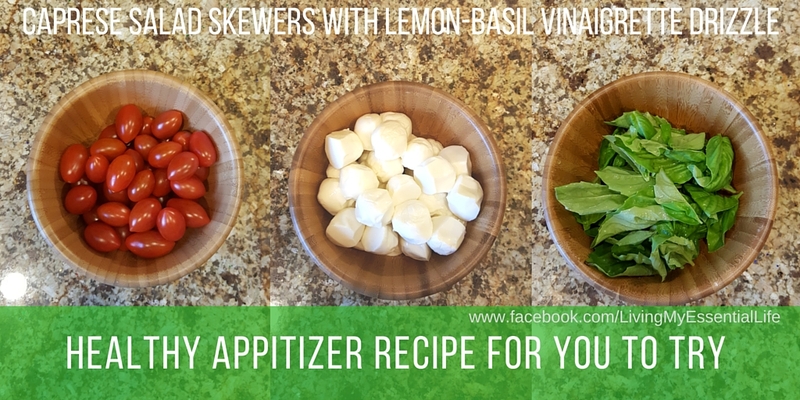 These Caprese Skewers with Lemon-Basil Vinaigrette Drizzle are the perfect bite-size appetizer for your parties. 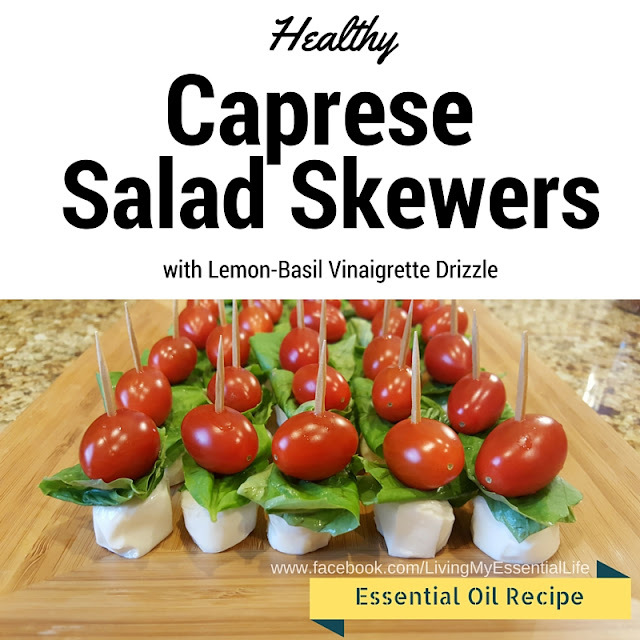 Enjoy this healthy stick of freshness in the summertime, or all year round! If you are like me, you are sick of going to parties where all they are serving is Buffalo Chicken Dip, Pickle Rollups, Chicken Wings and dips so fatty that you can actually feel your pants becoming too tight while you are wearing them. Well, here is a healthy option that your guests will absolutely love! These Caprese Skewers with Lemon-Basil Vinaigrette Dressing will leave them wanting more and asking for the recipe! Bright red juicy tomatoes, skewered with milky mini mozzarella cheese balls and fresh, springy basil leaves, drizzled with tangy-sweet lemon-basil vinaigrette drizzle. O.M.G. Better yet – No cooking! They are super simple to make! And take about 15 minutes to prepare! And because the dressing is made with essential oils, you get an extra benefit! 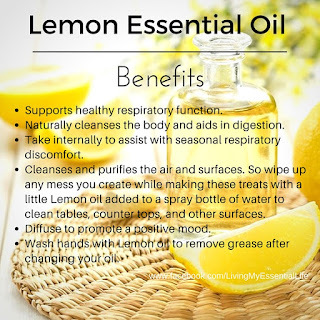 Cleanses and purifies the air and surfaces. 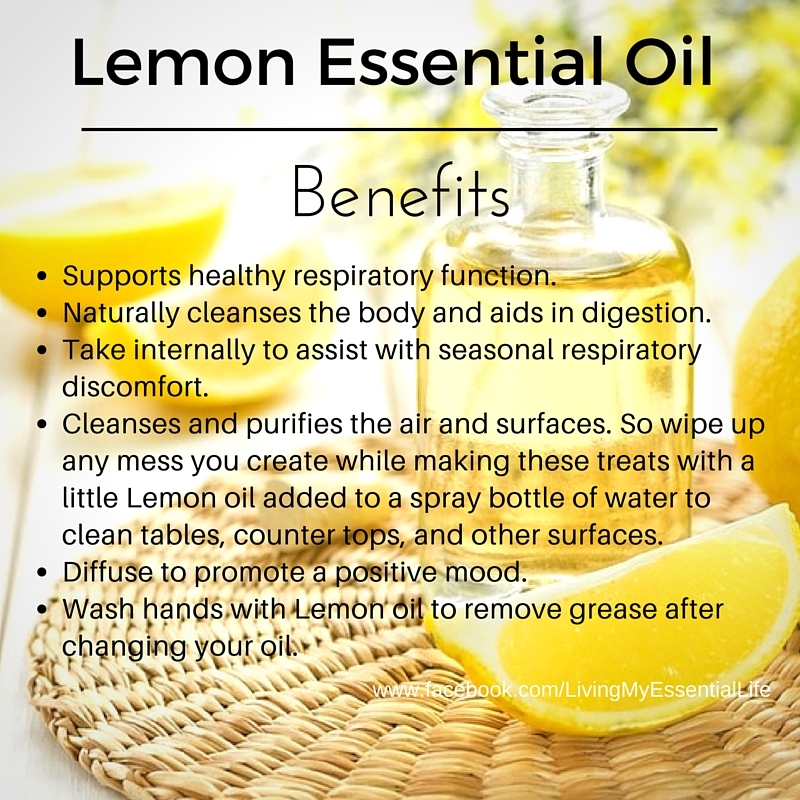 So wipe up any mess you create while making these treats with a little Lemon oil added to a spray bottle of water to clean tables, counter tops, and other surfaces. Mist a little Basil and water on your face to help keep you cool while prepping for your party. Diffuse to promote alertness and lessen anxious feelings. 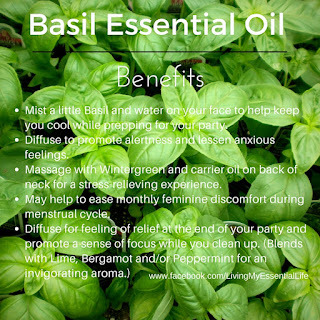 May help to ease monthly feminine discomfort during menstrual cycle. Are you ready to make these for your next party? Add the red wine vinegar, balsamic vinegar, sugar, garlic, olive oil, salt, pepper, Basil essential oil, and Lemon essential oil to a bowl and mix until combined. 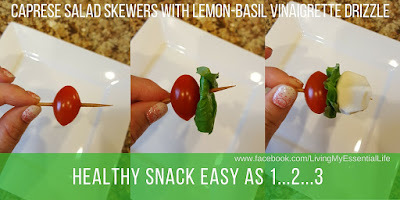 Thread the mozzarella, basil leaf (fold in half if large) and tomato onto a tooth pick. Repeat with remaining ingredients. Lay on serving platter. 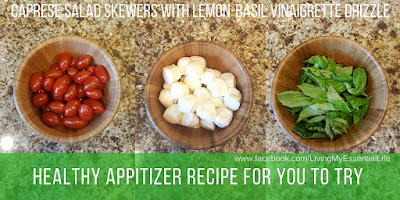 Drizzle lemon-basil vinaigrette on top of each skewer.